God states that on the day that Adam and Eve eat of the tree of knowledge, they will surely die (Gen. 2:17). But as the serpent predicts (Gen. 3:4–5), they do not die that day (though they do later). How are we to explain this? (1) Some interpret death as metaphorical, referring to the alienation from God implied by the expulsion from the garden (e.g. G.J. Wenham, R.W.L. Moberly, R.P. Gordon),49 but this view is unconvincing since it is not the most natural way of taking what is said. As James Barr pointed out,50 there are about forty other instances in the Hebrew Bible where we read that someone will surely die, and these all imply imminent literal death. (2) It has occasionally been proposed that môt tāmût means ‘you will surely become mortal’. This view is found, for example, already in Targum Pseudo-Jonathan (‘you shall incur the death penalty’), Symmachus (thnētos) and in Jerome (mortalis), who followed him,51 as well as by many subsequent Christian interpreters, and in modern times it has been followed by a few scholars.52 However, although providing a seemingly simple solution to the problem, this view is unlikely, since this meaning is nowhere else attested for this verb, and in addition it would appear that the first humans are already mortal, since Gen. 3:22 implies that they have not eaten of the tree of life (even though they had not originally been forbidden from doing so). (3) Should we see God as a liar and the serpent as telling the truth? This provocative view has been held by several scholars recently, including John Gibson and James Charlesworth.53 This seems unlikely, however, since it is natural to suppose that the reader is meant to identify with God over against the serpent, the latter being cursed in the end. Moreover, we should observe that the serpent is telling only a half-truth in stating that their eyes will be opened but they will not die. For death is clearly depicted as the ultimate result of their disobedience, since the couple no longer have the possibility of accessing the tree of life following their expulsion from the garden (cf. Gen. 3:19, 22, 24). Although death does not happen immediately, the couple’s fate is sealed from the moment they disobey God. (4) It has occasionally been pointed out that beyôm can mean not only literally ‘on the day that’ but also more broadly ‘when’, so that one might render ‘for when you eat of it you will surely die’.54 For example, Jer. 7:23; 11:4, 7 refer to things God is supposed to have said when he led the Israelites out of Egypt, but the subject matter concerns God’s commandments to the Israelites to obey, which sounds more to do with the Sinai covenant than anything happening on the literal day of deliverance from Egypt. There is also other evidence that yôm could sometimes mean ‘time’ rather than a specific day, though the latter is most frequently intended. Indeed, a specific day does appear to be intended in Genesis 2–3, since the serpent takes up the expression beyôm in Gen. 3:5, saying to the first humans, ‘You will not die; for God knows that on the day you eat of it your eyes will be opened, and you will be like gods,55 knowing good and evil’, and as we see from Gen. 3:6–7, this happened immediately on the very same day. 49 G.J. Wenham, Genesis 1–15 (WBC, 1; Waco, TX: Word Books, 1987), p. 90; R.W.L. Moberly, ‘Did the Serpent Get it Right?’, JTS 39 (1988), pp. 1–27 (16–18); idem, ‘Did the Interpreters Get it Right?’, JTS 59 (2008), pp. 22–40 (34–37); R.P. Gordon, ‘The Ethics of Eden: Truth-Telling in Genesis 2–3’, in K.J. Dell (ed. ), Ethical and Unethical in the Old Testament: God and Humans in Dialogue (LHBOTS, 528; London: T&T Clark International, 2010), pp. 11–33 (22). 50 J. Barr, ‘Is God a Liar? (Genesis 2–3)—and Related Matters’, JTS 57 (2006), pp. 1–22 (12). 51 A. Salvesen, Symmachus in the Pentateuch (JSSMS, 15; Manchester: Manchester University Press, 1991), pp. 9–10; Jerome, gloss on Gen. 2:17 in Liber Hebraicarum Quaestionum in Genesim 308 (PL 23, col. 941). 52 Cf. Cassuto, A Commentary on the Book of Genesis, I, pp. 124–25; Speiser, Genesis, pp. 15, 17; D. Jobling. ‘The Myth Semantics of Genesis 2.4b–3.24’, Semeia 18 (1980), pp. 41–49 (47); A. LaCocque, The Trial of Innocence: Adam, Eve, and the Yahwist (Eugene, OR: Cascade Books [Wipf & Stock], 2006), pp. 99, 101, translates ‘deserve to die’. 53 E.g. J.C.L. Gibson, Genesis (2 vols. ; Daily Study Bible; Edinburgh: Saint Andrew Press, 1991–92 ), I, pp. 113–14; Charlesworth, The Good and Evil Serpent, pp. 275–324. 54 So niv; similarly God’s Word translation. 55 The Hebrew kēʾlōhîm is ambiguous, but on balance the translation ‘like gods’ seems preferable to ‘like God’, since in Gen. 3:22 God states that the humans have come to know good and evil ‘like one of us’, including both God and his heavenly court. The translation ‘like gods’ is also supported by the lxx, the oldest translation we have (in addition to the Vulgate). It is also sometimes argued in favour of the plural ‘gods’ that the verb in the immediately following expression yōdeʿê ṭôb wārāʿ, ‘knowing good and evil’, is in the plural. Since, however, the ‘you’ being addressed here is also in the plural it is difficult to feel totally confident about this particular argument. 56 H. Gunkel, Genesis (HKAT, 1.1; Göttingen: Vandenhoeck & Ruprecht, 3rd edn, 1910), p. 10, et Genesis (trans. M.E. Biddle; Macon, GA: Mercer University Press, 1997), p. 10; J. Skinner, A Critical and Exegetical Commentary on Genesis (ICC; Edinburgh: T. & T. Clark, 1910), p. 67; von Rad, Das erste Buch Mose, p. 77, et Genesis, p. 92; D.J.A. Clines, The Theme of the Pentateuch (JSOTSup, 10; Sheffield: JSOT Press, 2nd edn, 1997), p. 70; Barr, ‘Is God a Liar?’, p. 22; J.T.K. Lim, ‘Did the Scholar(s) Get it Right?’, in R. Boer, M. Carden and J. Kelso (eds. ), The One Who Reads May Run: Essays in Honour of Edgar W. Conrad (LHBOTS, 553; London: T&T Clark International, 2012), pp. 69–79. Cf. J. Milton, Paradise Lost III.38–42 (cited in Gordon, ‘The Ethics of Eden’, p. 20). 1. Day, J. (2013). 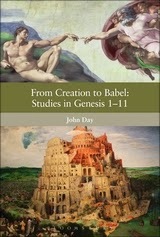 From Creation to Babel:Studies in Genesis 1–11 (pp. 38–41). London; New Delhi; New York; Sydney: Bloomsbury.